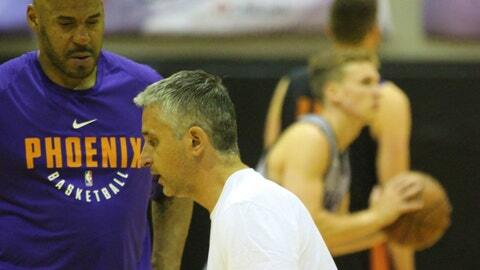 PHOENIX — At the beginning of each of the Phoenix Suns’ summer camp practices, new coach Igor Kokoskov puts his team through a specific routine. He calls it “basketball yoga” — perhaps a cheesy nickname, he admits, but a drill that teaches his players two critical fundamentals: balance and control. Kokoskov is doing a balancing act of his own this offseason as a first-time head coach. The longtime NBA assistant and European coach has hit the ground running since being hired in May, doing his best to live up to General Manager Ryan McDonough’s description as a “pioneer,” the creative basketball mind that can shake the franchise out of obscurity. Less than three months on the job, Kokoskov already has many balls in the air. He personally worked out dozens of prospects during the pre-NBA Draft process in June, helping the Suns decide to take Deandre Ayton with the top overall pick. He will coach the organization’s Summer League team in Las Vegas beginning Friday. He’s trying to implement a new system, too, with a young roster that lost more games than any other team in the league last year. His plate has been filled in a hurry. Balance will be crucial. Kokoskov will be one of just four current head coaches to man the sidelines during the NBA Summer League in Las Vegas and the first Suns coach to do so since Jeff Horneck in 2013. It also was his first season at the helm. The Suns’ practices leading up to the tournament have reflected that attitude. Forward Josh Jackson, who will be participating in the Summer League for the second straight year, said the energy in the Kokoskov-led practices has been “amazing.” After practice on Wednesday, Ayton recognized the step-up to the pros. Ayton has taken quickly to Kokoskov’s style. The new head coach has made a strong first impression on the first pick in the draft. Ayton used the “basketball yoga” as an example. Near the beginning of each practice, Kokoskov has his players go through a series of motions: Jump to the side, land on one leg, shoot the ball. Or do a 180-degree spin, then another one, then shoot the ball. If players can learn to launch shots on one foot or after spinning through the air, shooting normal should be second-nature. They’re learning how to control their bodies in uncomfortable situations. Ayton said he had never heard of basketball yoga before, but those who have had vouched for its effectiveness. Second-round pick George King said basketball yoga’s “one-legged, funky shots” were part of his successful pre-draft program earlier this offseason. Dragan Bender said he’s been doing variations of the routine for years while growing up in Europe. Kokoskov’s personal balancing act, meanwhile, will continue in Las Vegas this weekend. He didn’t go into specifics on how he will divide minutes among a roster mixed with rookies and returners, nor did he reveal much about which roles his players will fill — besides saying on Wednesday that Ayton will play center and Bender will play power forward. While most coaches are quietly observing this time of year, Kokoskov is going hands-on, trying to mold his team into the balanced unit he thinks can make the Suns relevant again.